In the Shade is proud to celebrate 32+ years in business. The original owner, Jan Scott works right along with her staff as a design consultant. We offer a complete line of Hunter Douglas blinds, shades, sheer shadings, and shutters and are one of the preferred and elite Hunter Douglas Gallery showrooms offering the exclusive Alustra® Collection - a unique collection of stunning fabrics and hardware options. Complete the look with the addition of a custom drapery and top treatments. Our goal is to offer a unique shopping experience. We are your window treatment motorization expert. Let us create custom window treatments for your home or business that can operate with a remote, timer, or with a click of a button from your mobile device or tablet. Hunter Douglas PowerView® wireless technology also works seamlessly with popular smart-home systems like Google Assistant, Amazon Alexa and more. No need to get up, search for the remote or mobile device. Let your voice command your window coverings to open or close. We also offer motorized draperies. Our professional team has over 130 years of combined experience and knowledge in the interior design and window covering industry. We will create the perfect, one-of-a-kind drapery, cornice, valance, top treatment or custom bedding and pillows to accent your personal lifestyle and vision. From custom draperies, top treatments, comforters, bed skirts, headboards, pillows, upholstery and more; let us bring your home decor ideas to life. Call to schedule your complimentary in-home appointment today! Visit our state-of-the-art showroom containing large working displays of blinds, shades and shutters, so you can see, touch and operate all the beautiful window fashions we offer. Our professional staff will walk you through your choices, allowing you to make a more informed decision for your windows - ensuring your long-term satisfaction with your purchase. A design consultant will then come to your home with samples to help your determine the right color, operating system, privacy desires, decor style and more. Motorization has never been more affordable. 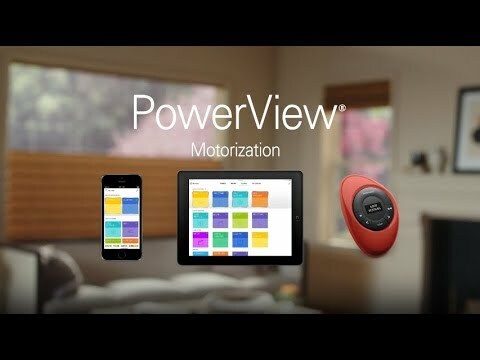 Hunter Douglas PowerView Motorization is a revolutionary new wireless system that automatically moves your shades throughout the day, so you don't have to...even when you aren't home! Program your blinds and shades to open and close using the PowerView Pebble® remote control or with your mobile device or tablet. With no exposed cords your blinds and shades are child and pet friendly too. Explore creative ideas and smart solutions for your windows with our online brochure. It's the ideal introduction to Hunter Douglas window coverings, available at In The Shade. In The Shade offers a large selection of custom Hunter Douglas window treatments, including sheers and shadings, honeycomb shades, shutters, horizontal blinds, vertical blinds, Roman shades, roller shades, and woven wood shades. We proudly serve Stuart, Jupiter, Palm City, Port St. Lucie, Hobe Sound, Jensen Beach, Tequesta, Fl and surrounding areas.